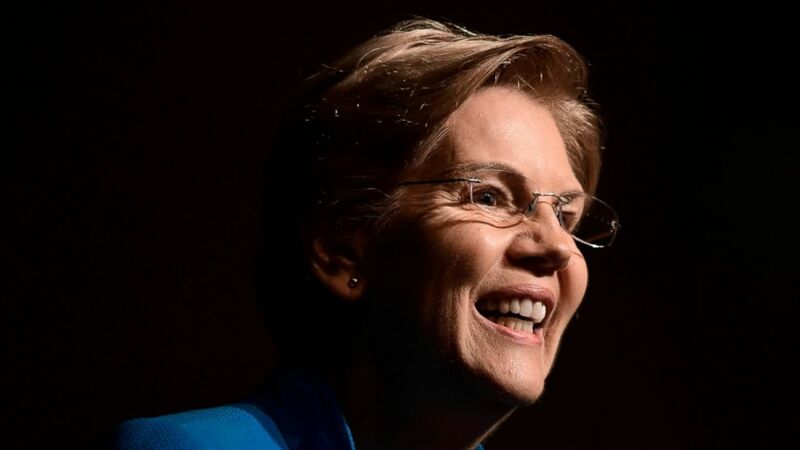 Sen. Elizabeth Warren seized on criticism Tuesday from two potential presidential rivals who are billionaires to highlight her proposal to raise taxes on top earners. Former New York City Mayor Michael Bloomberg blasted the Massachusetts Democrat's "ultra-millionaire tax" as "probably unconstitutional." During a two-day visit to the early voting state of New Hampshire, Bloomberg said "we shouldn't be embarrassed by our system" and warned against a slide toward Venezuela's imploding socialist economy. His comments followed a jab from former Starbucks CEO Howard Schultz, who called Warren's plan "ridiculous" in an NPR interview. "Another billionaire who thinks that billionaires shouldn't pay more in taxes," she told The Associated Press. "No surprises — but that's also not how we're going to build a future for this country." It comes as the early days of the Democratic primary are dominated by a debate over the risks of staking out positions that opponents could brand as too liberal. Bloomberg, who is eyeing a White House run as a Democrat, has urged caution on policies related to taxes and health care. Schultz, who said this past weekend he's considering running for president as an independent, is also seeking to appeal to moderate voters. Conservatives have lambasted Warren's idea as a violation of constitutional prohibitions on "direct" property taxes that are not applied proportionally to specific states, a criticism that Bloomberg echoed on Tuesday even as he allowed room to debate the current state of income tax rates. "People earn money to pay their taxes, and then they don't expect the government to come back and take some of it away," he told reporters. "I think you can question whether or not we have the right tax rates." Bloomberg noted that he criticized the tax cuts President Donald Trump and the GOP passed in late 2017 as overly skewed toward the wealthy, even as he linked Warren's proposal to the failings of socialism in South America. "If you want to look at a system that is not capitalistic, just take a look at what was perhaps the wealthiest country in the world and today people are starving to death. It's called Venezuela," Bloomberg said. Progressive Change Campaign Committee co-founder Adam Green, whose activist group backs Warren's nascent presidential bid, underscored the upside for Warren in taking on two ambitious multi-billionaires over her tax plan. "Not since 'Nevertheless, She Persisted' has a bigger political gift been handed to Elizabeth Warren than out-of-touch billionaires attacking her for wanting to tax their wealth to open up health care and educational opportunities for millions of voting Americans," Green said. Ramer reported from Nashua, New Hampshire.